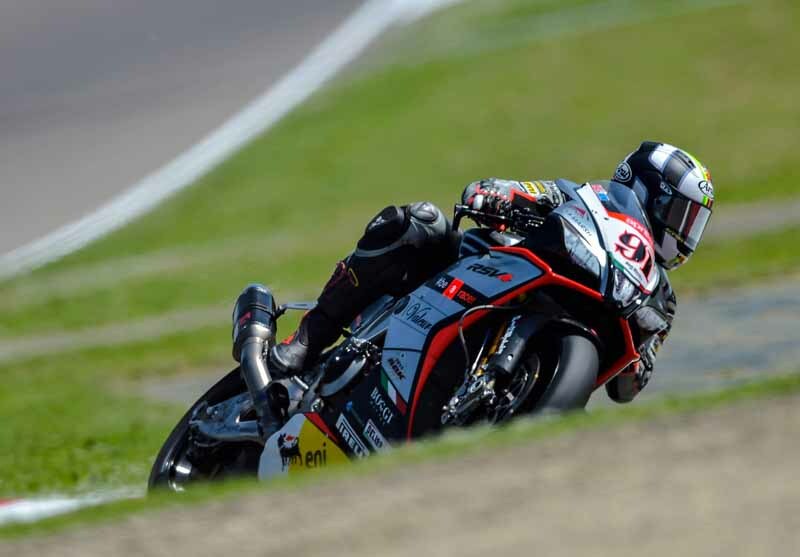 Imola, 8 May 2015 – With the Imola track warmed by a summer sun and the passion of the fans who came out to watch from the beginning on the banks of the Santerno, Team Aprilia Racing – Red Devils began their weekend at Imola. This is a decidedly demanding historic track and a favourite among the riders because of its “old style” character. Precisely because of its unique layout, it takes some fine tuning to set up the technical, chassis and electronic management aspects. These are the parameters that Leon Haslam, lying second in the overall championship standings astride his Aprilia RSV4, focused on during today’s sessions. During the morning practice session the Brit lapped quite a lot without using a “fresh” tyre, but beginning to work straight away on race strategy. He also tested various different solutions in the afternoon when, despite putting in less laps, Leon and his team gathered some fundamental data on which to base tomorrow’s strategy. In light of the type of work done today, the fifth time in the combined standings seems promising for another weekend as protagonists for the Haslam-Aprilia duo. The goals were different in the number 81 garage for Jordi Torres. The Spanish rookie set foot on the asphalt at Imola for the first time today, struggling a bit to interpret one of the most complicated circuits on the calendar. So it’s only logical to expect some irrelevant times on this first day which Jordi used to gain confidence with his RSV4 RF and on the track before asking for any substantial changes from his mechanics. The Spanish rider did not point out any particularly critical points, but rather a simple lack of familiarity and experience that require a calm approach to the first part of the weekend.